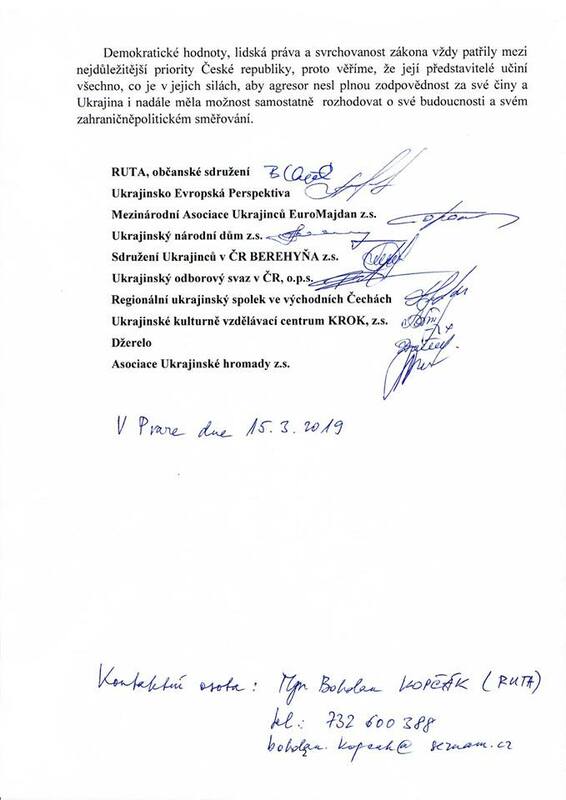 During the meeting of the coordination council of the Ukrainian organizations in Czech Republic on Friday, March 15th, the heads of the Ukrainian organizations have agreed on the text of the Statement, addressed to the Parliament, the cabinet, political parties and to the public of Czech Republic, in which they have appealed to support Ukraine in its struggle with the Russian aggression and to impose stronger international sanctions on Russia, that has been conducting active armed aggression towards Ukraine for the last 5 years. Five years ago the phase of the explicit Russian aggression towards Ukraine has started. Having occupied Crimea and having seized the part of Donetsk and Luhansk regions of Ukraine, Russia has violated tenths of norms and principles of international law, including the Statute of the UN, and also several bilateral Ukrainian – Russian agreements. The unannounced war against Ukraine, started by Russia, has already become the longest active military conflict in the modern history of Europe. Nearly on the daily basis Ukraine is losing its best sons and daughters on the frontline. As a result of Russian aggression 44 000 sq km or 7% of the Ukrainian land has been occupied. As a result of the Kremlin actions, Ukraine is bearing large losses -human and economic. This war has already taken lives of more than 13 000 Ukrainians, more than 28 000 have been wounded. 1,8 million residents of Crimea and Donbas have been forced to flee their homes. Occupied territories were turned into the black hole by Russia, where human rights are violated on a daily basis. Tenths of Ukrainians and Crimean tatars were put behind the bars due to the falsified accusations – both on the occupied territories as well as in Russia itself. Many people who disagree with the Kremlin regime, are being persecuted and tortured, have disappeared or were killed. Despite the pressure from the international community, Russian is not only not stopping its aggressive actions, but is also amplifying them – today Kremlin is already trying to annexate the Azov and the Black seas and the Kerch Strait. Hybrid war of Russia against Ukraine does not only consist of the military instruments, but also of the mass desinformation and propaganda campaign, cyberattacks, attempts to destabilize domestic political and economic situation in Ukraine. 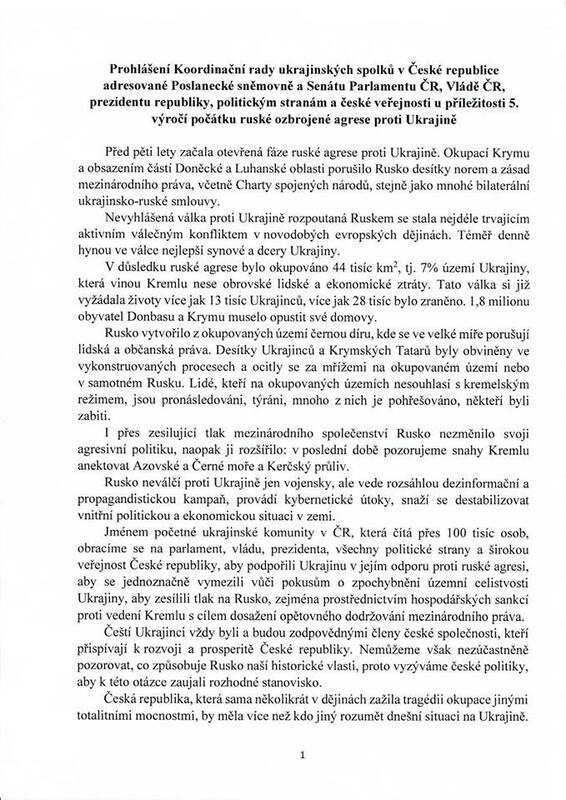 We, Ukrainians in the Czech Republic, representatives of more than 100-thousand people large Ukrainian community, leaving in the Czech Republic, are addressing the Parliament, the Cabinet, the President, political parties and public of the Czech Republic with an appeal to support Ukraine in its struggle with Russian aggression, to make a clear univocal statement against attempts to doubt the territorial integrity of Ukraine, to increase pressure on Russia, especially by increasing the economic sanctions against the Kremlin leadership, in order to force it to return to the norms of the international law. Czech Ukrainians have always been and will always be responsible members of the Czech society, who are contributing to the prosperity of the country. However, we cannot calmly witness lawless actions of Russia against our historical homeland, and therefore we are appealing to the Czech politics with a request to take a position of the principle regarding this issue. Who, if not Czech Republic, that has itself lived through the tragedy of occupation by the totalitarian regimes, would understand the most of what is happening in Ukraine today? We believe, that Czech Republic, that has always had democratic values and the rule of international law as its priorities, will do everything possible in order for the aggressor to be responsible for their actions, and for Ukraine to get an opportunity to choose its own future and its own course of the foreign policy.